This is our church sign at Asbury right now. 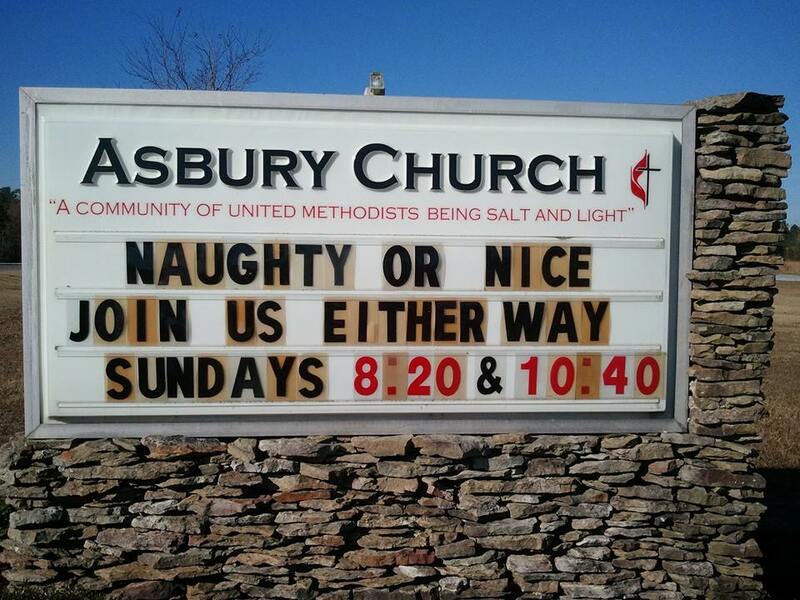 Now this isn’t just plug for Asbury (though we’d love to have you worship with us sometime!) This sign makes me smile every time I see it? Why? Is it simply because it’s a play on the “naughty or nice” part of the Christmas season? Maybe. But, mainly because it expresses something that I (and Asbury) believes fully about God. God loves nice people. God loves naughty people. God loves all people. And God wants to be in a relationship with all people. Because God so loves the world. The naughty and the nice. Santa comes to check if you are naughty or nice. Jesus came to save the naughty, and the nice. Because He loves both. And both need Him. Jesus came, seeking out the lost. The broken. The needful. Because He loves them. He cares for them. And they are His. He was born to save them. He was born to save us. No matter where we are. No matter what list we are on. That may matter to the world, or to Santa. But it doesn’t matter to God. Naughty or nice, it doesn’t matter to God. He doesn’t love us because we are good. He loves us because He is good. Never forget that. Ever. He simply loves you. No matter what.